The Rise of the Lifestyle Lift: How is it Replacing Stairlifts? What do the common stairlift and the trusted lift have in common? They both enable our customers freedom to quickly and easily move from one level in a building to another. In their homes this is important for giving them, and their family, back their freedom and independence which circumstances may have taken away from them. Though both of these methods constantly work to enable easy and efficient movement throughout a building, they’re not in equal use. In our customer’s homes, you may be surprised to discover, that the archaic stairlift is being used less and less while lifts are taking a dynamic and efficient step into the domestic and commercial lime light. Age, accidents, medical and genetic conditions are all reasons why customers may find using their home staircases difficult. When this happens, you may find that they will turn to the first solution to their problems; a stairlift. Though we hear about the many benefits of a stairlift, the lifestyle of your customers can instead be greatly improved with the addition of a simple domestic platform lift into their homes. Though technology has advanced, we see that the design and overall appearance of the stairlift hasn’t moved much farther than its first conceptualised design. Installing an electronically moving chair into a staircase may work for some stairs but not for all. Narrow or old staircases may not be suitable for sustaining a working stairlift. 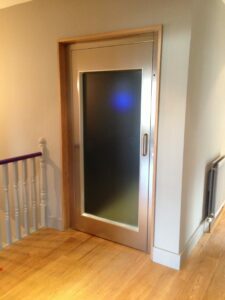 Domestic lifts, however, can be fitted into any building for efficient movement. With a wide range of makes and models, domestic lifts can be subtly integrated into the home with personalised bespoke designs. Unlike a stairlift, domestic lifts can be neatly tucked out of the way, drawing little to no attention to them depending on your clients wish. Sometimes the mobility of our clients, is significantly reduced. A stairlift in their home may make it more difficult or painful to use depending on the extent of a person’s disability. Wheelchair users, for instance, may find using a stairlift significantly harder than users suffering from arthritis. With their ability to offer easy movement for a diverse audience, lifts have become more and more popular in the home and in commercial environments. This offers more independence for the person in question as well as giving surrounding family members peace of mind of the individual’s safety when moving around the home and businesses. How many stairlifts have you seen in shopping centres and business buildings? Stairlifts travel at a slower speed to a lift which can eat up precious time when your clients are and about, not to mention their exposed rails and mechanisms puts them at greater risk of damage. Platform lifts, however, can be integrated into any building without fear of damage. Sturdy and resilient, their ability to withstand heavy loads makes them far more usable and adaptable compared to stairlifts. 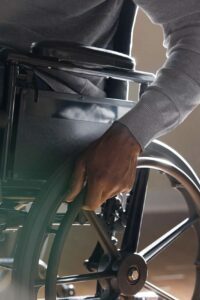 Mobility in and around the home is essential for granting individuals their independence and the freedom they deserve. The rise in lifestyle changing lifts isn’t just a welcomed change to the standard stairlift, it’s a vital in ensuring the safety and confidence of the individual is met in a secure, comfortable and trusted environment. Here at Axess2 we understand that the safety and comfort of your clients is at the forefront of your mind. We also understand that not everybody wants a lift to stand out in their home or business. We offer a range of efficient platform lifts and a bespoke service which allows you and your client to design the interior and exterior look of their chosen lift; simply contact us 01200 405 005 on to find out more. Alternatively why not get in touch with us via our Facebook, Twitter, Google+ or YouTube pages!